California is home to over 740,000 members of LDS Church as well as seven Mormon temples. California has had a long history with the Mormon Church, starting with members who sailed to San Francisco aboard the Brooklyn. Then when members of the U.S. Army unit known as the Mormon Battalion were discharged in San Diego, many stayed and helped build up the San Diego area. Members arrived in Fresno in 1907 and by 1920 a congregation, called a ward, was organized. The area continued to grow and at the time of the temple dedication there were 28,000 members in the Fresno area. Elder John B. Dickson, of the Seventy, conducted the groundbreaking ceremony in March of 1999. Before the temple was dedicated it was opened to the public. During that time 53,000 people toured the temple. After the temple is dedicated only members with a temple recommend will be able to enter because of the sacred nature of the ordinances performed inside. The Fresno California Temple has the same design as the other smaller temples that are being built worldwide. 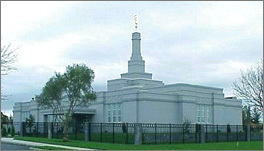 The exterior is white sierra granite and features a single-spire topped by a statue of the angel Moroni. It has a total of 10,700 square feet, two ordinance rooms, and two sealing rooms. This page was last edited on 24 January 2012, at 11:25.